Raise your hand if you love seeing Christmas trees on cars and trucks and other moving vehicles. Whether it’s a pillow or place mat… a cute vintage truck with a Christmas tree stuck in its bed at Home Goods… or that first car going down the road with a fresh-cut tree… I smile. Every time. I am in love with Christmas trees on cars. So when my wonderful blogging friend, Malia from Yesterday on Tuesday asked if I’d like to join her for a Christmas Trees on Cars Blog Hop… of course I said yes… without another thought. I had so much fun creating little vignettes last year with an assortment of “cars” from my friend. This year… I scoured the stores looking for the perfect vintage cars or trucks. One of my friends even joined in the hunt. And we found one. Actually several, but one in particular made my heart sing. And then I did what every enthusiastic blogger does at some time. I got stuck. I couldn’t decide… other than tying on a tree… what to do with my car. It’s like my brain shut down and creativity came to a halt. After banging my head on the wall for a few days I decided I needed to shelve that car and go a different route. After a couple of wrong turns… I finally had a happy idea. Yay! I was playing around with some mason jars for another project and wondered if this fun fabric, covered with cars and trucks with Christmas Trees, which I was planning to use in a different way, would work with my mason jar lids and rings. WooHoo! The perfect marriage. It was then I remembered some artificial evergreen twist ties I had seen in a local store. In my mind I could picture the exact spot in the store where they were hanging. A quick trip in an out and I would be on my way to my creative happy place. Except. Except they weren’t there when I went to the store. And after consulting with different store associates, including one who told me that she stocked the entire Christmas section herself and knew they didn’t have any because she hadn’t put any out. My husband was with me on my first jaunt, so he can vouch that I wasn’t seeing things or remembering a different store. Because I was determined that those evergreen twist ties were essential to my project I popped over to Hobby Lobby and one of their associates took me directly to them. I’m pretty sure there was band and choir to celebrate. Are you read for a little Christmas creativity? Note: I purchased my items locally, but for your convenience I’ve added Amazon affiliate links here. Using your mason jar ring, trace the outside edge on your heavy card stock. Repeat for as many ornaments as you’re making. Using your scissors, cut out the card stock rounds which will be used for the backing of your ornaments. Iron your fabric before beginning, then lay out fabric and frame the cars or truck you’ve selected for your ornaments with the mason jar ring. Lay your lid with the metallic side down on the table and the rubber seal side up. Lightly run a bead of Aleene’s glue around the rubber seal. Carefully lay a fabric circle – right side up – on top of the lid with the glue/seal side up. Smooth out the fabric and with your finger using a little pressure on the fabric going over the seal. This will make it much easier for you to insert the fabric and lid into the ring. Insert your fabric cover lid in the ring. Then lay the ring with the fabric covered lid… fabric side down on your work surface. Carefully add a wee bit of hot/cool glue around the edge of lid to secure it to the ring. Let it set. Grab a mason jar and lightly twist on one of your ring/lid/fabric sets. These need to come off again easily, loose is key. Hold your jar between your knees. With two hands… one on each end of the evergreen twist tie… bend the evergreen twist tie around the metal mason jar ring. Don’t twist the ends together, just yet. Remove the evergreen twist tie from the jar ring. Take a length of ribbon cut for hanging (be generous so you have plenty to knot and tie off) and lay it over the lid and let it drape down on one side only. Place the evergreen twist over the jar ring so that a single length of ribbon is between the ring and the evergreen tie. Place your evergreen twist tie around the mason jar ring and pull hard so that it’s very snug. Twist the end twice to secure your evergreen twist tie. Using your wire cutters, trim the excess evergreen twist tie as close as possible. Push in the sharp ends. Unscrew the lid from the jar. Draw the ribbon ends together and knot to create a hanger. Shift the ribbon around to the proper hanging spot. Add a very thin bead of hot glue around the back edge of your mason jar ring and then quickly place the card stock round on the glue and press down to firm. Arrange your Christmas ornaments (sans evergreen twist ties) in a pyramid fashion on a piece of heavy poster board, foam core board (I used black), or cardboard. Trace around the “tree” with a pencil. 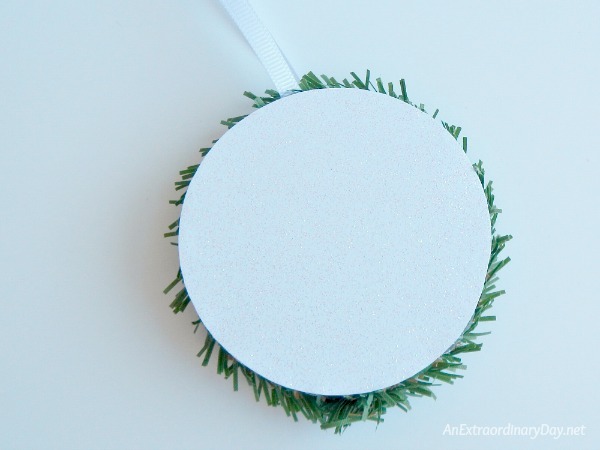 Using a sharp cutter, cut a backing for your ornament Christmas tree out of the cardboard, etc. Re-arrange your mason jar rings on the backing and then hot/cool glue them in place. I needed to do a little trimming… so be prepared to do that. Because I used black foam core board, I needed to paint the white foam that was showing with a small paintbrush and black paint to give it a finished look. Replace the evergreen twist ties around the mason jar rings. It might be a little bit of a squeeze to get them on between the rings. Add a ribbon for hanging to the top ornament. Glue a piece of wood to the bottom of your tree for the trunk. You could use a piece of paint stick or a wood slice. I used a small piece of driftwood. Hang your tree and admire your work. These mason jar lid Christmas ornaments really are fun and easy to make. You should be able to make a bunch of them in no time at all. It would be a great project for older kids… or kids old enough to handle a cool glue gun. I think it would be great to have a Christmas tree in a boy’s room covered with these Christmas trees on cars and trucks ornaments? For more great inspiration… visit my friends who are sharing terrific DIY ideas with the Christmas trees on cars theme. OH MY GOSH Diane I am in Mason Jar/Car heaven! You have outdone yourself with this one! What a fabulous idea, it’s so charming. Absolutely love!!!! Oh, Diane! I love these! What a creative idea! Now I have got to find some of that fabric …. Your project is AMAZING! I thought the ornaments were embroidered when I saw it in the collage. Great work! Pinned. This is so cute! My boys would love make these this Christmas! Diane, that fabric is PERFECT and I love the ornaments you made! But I really gasped when I saw the tree you made with all of the ornaments! You are so creative! I was hoping to find some fabric at my fabric store… but for an entirely different project. It didn’t work out for my first idea… but it was so cute I knew I had to use it in some way. Glad it all worked out. Thanks, Steph for your kind words. You are such a talented Lady! This turned out darling, and perfect too! Awww…. thanks Kim! In case I’m not clear… my ornaments were made with fabric… not wrapping paper. But… wow! Wouldn’t it be fun to have trees on cars wrapping paper?!! Oh wow!! Sarah… it’s so nice to see you here. 🙂 Thank you for your kind thoughts. I’m coming over from Home Talk. These are so adorable. I am always looking for ways to repurpose things and this is a great idea for the mason jar lid rings. Love the cute fabric. I like the Christmas tree too. I’m a new follower. Welcome Cecilia! It’s good to have your here!! And thank you for your kind thoughts. Funny isn’t it how “Plan C” can be the best plan? All the best for an extraordinary weekend! Where did material come from. Thanks! Sue… if you scroll up to the supply list there is a link there to the fabric. Hope that helps. 🙂 Have fun creating!!! This is such a sweet project! The fabric is adorable! Thank you Kathy! I’m so happy to have happened on it. All the best for an extraordinary finish to your week!